After stepping away for a few days, I came back with a fresh mind and was able to fix the bug that was driving me crazy... and it only took a few minutes! I ripped apart the code trying to find the bug, so I need to do some cleanup. Now that everything is working I can spend more time playing and testing - I'll probably tweak the controls a little more or make a few more minor changes. So, just a little more work until the Android version is finally complete! I might be done with the Android version of my new darts game! 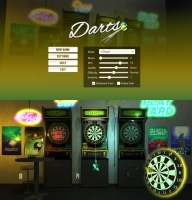 I started working on the Android version of the new darts game. I added a menu/settings screen, music, sound effects, and several other improvements! There are four player modes now: 1-player, 2player, 1-player vs computer, computer vs computer.